consists of 4 individual listening centers. Each child is in charge of their own story and book! They love the fact that they are completely independent and everything is up to them! Books are stored in the middle box and each nano is clipped to where the child should sit to read. 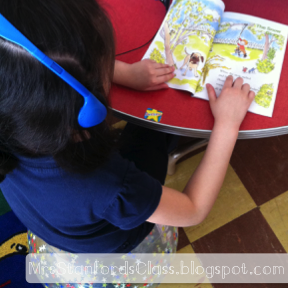 Students then follow the prompts to turn the page and follow along in the story. Our book box includes many different levels of books to meet all needs of all readers. My students love this center!! My students are fortunate enough to have 6 computers and navigate our class website on their own. 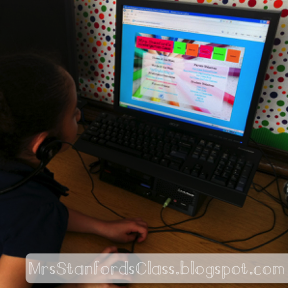 On my class website students have the option of a few student websites and many students use the website at home during their free time. My students were fortunate enough to receive 2 iPads from www.donorschoose.org/mrs.stanford My students absolutely adore this station! I have organized the apps onto subject area pages and ask them to work on specific skills during specific work times. Students are also rewarded for behavior and academics with time on the iPad throughout the week. My students' comfy corner is another wonderful item in our classroom from the generous people of donorschoose! 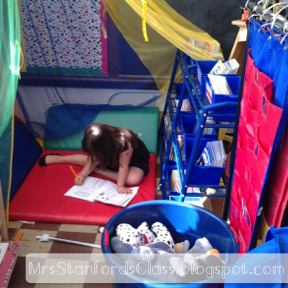 The have comfy mats, a canopy, and easy readers of different levels to build their love of reading! I still remember my reading corner from grade school and I remember trying to recreate it at home. 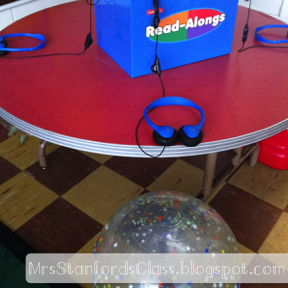 I wanted to give my students the same feeling to associate fun and excitement with reading! Well we have much more to share, but I'll save some for next time! I would love to follow your blog, but you don't have a follower's button yet. Think about adding one as many TPT people would love to be a part of your blog. Come by and visit mine sometime. I am your newest follower!! Just found you through TpT. I am also giving you the Lovely Blog Award!! Hop on over to mine to get it!! Your blog is adorable! 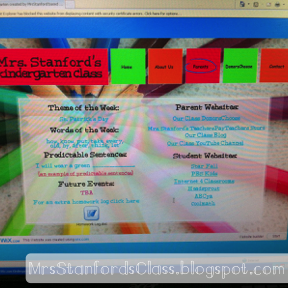 I love all of the ways you have integrated technology into your centers. Hi Jessica and welcome to the blogging world and TpT. I am now following you on both. Come by and visit when you get a chance. Thank you all for your kind words! I will be sure to check out all of your blogs as soon as we get home next week :) thanks for all of the follows!! I can't wait to share ideas with all of you!! Love the blog so far. Welcome to blogging. TAG your it. Come to my blog for details and rules for playing blog tag. Thanks for visiting my blog: Yours is wonderful! Thanks for stopping by my blog and for your sweet email! Thanks for the follows. Be sure to enter my giveaway (newest post) to enter to win a $20 donation to donorschoose! Thanks <3 don't forget to enter the giveaway! the SANSA clip players and I'd like to know what you like about the Nano's . 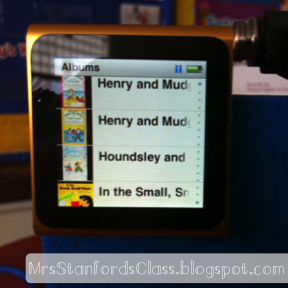 Where do you get your downloads...I wish Scholastic would make all of their CD read alouds available as MP3 files? Those earphones look really light, but sturdy. Where are those from? And, I'm really jonesing over your balls to sit on. Those are awesome! Awww thanks for stopping by! She is too sweet!! I have the same questions as Donna does above. I'd love to convert my listening center to MP3 players next year. How about a post on the details?